It was hot as the devil’s ding that day. Jorts were necessary. 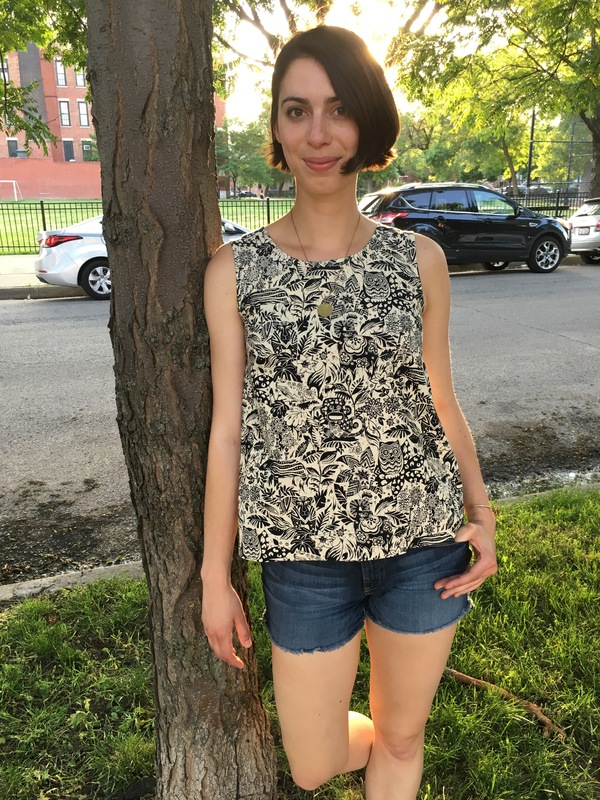 So was this breezy Willow Tank. This tiki fabric—a dinky remnant—spoke to me. I know tiki culture is a manufactured, Polynesian-inspired entity, but I’m a sucker for it. Give me a strong mai tai and a banana that’s been fashioned into a dolphin and I’m happy. The remnant wasn’t enough to make much of anything, but it weaseled its way into my heart and eventually into my shopping bag. 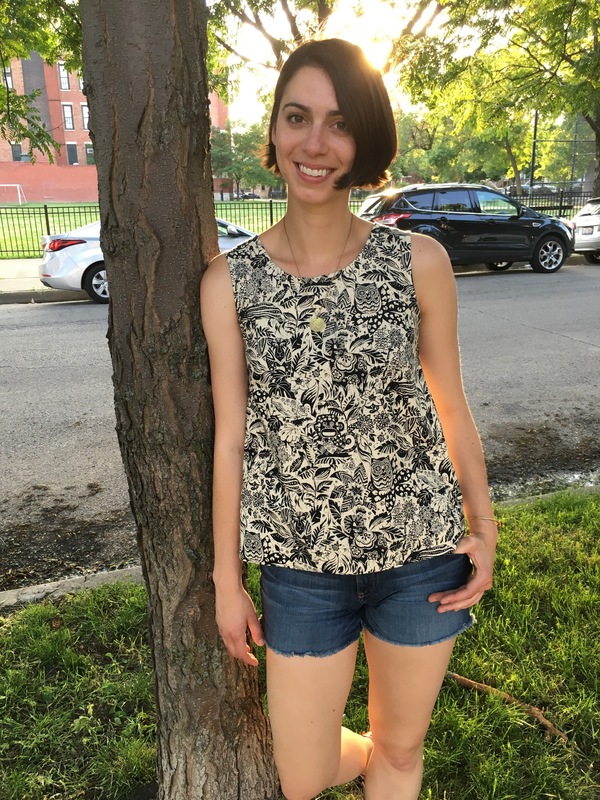 And then Grainline Studio released the lovely Willow Tank Dress, a simple A-line tank (plus a dress option) with bust darts and a deep hem, perfect for making the most out of a teensy lil bit of fabric. You can barely spot it because the print is so busy, but I had to cut the back in two pieces rather than on the fold. I added 1/2″ seam allowances, sewed them together to create a single piece, serged the raw edge, and pressed the seam to one side. Added 1 3/8″ at the “lengthen here” line. The bust darts hit a little low. Next time I’ll probably raise them a smidgen. Dreaming about making this in the dress iteration in black or navy linen. Have you tried this pattern yet? Thoughts? Think I may have to buy this pattern.willow looks great on you. So cute! You inspired me to make two pairs of shorts to wear at the beach. One is a batik kinda like this fabric! Woohoo! Can’t wait to see them. And also, can’t wait for vacation! Lovely top, the fabric looks so nice and the back seam is practically invisible. Such great fabric!!! It looks superb on you!